Forget the 100-mile eat-local diet; try the 300-square-foot-diet — grow squash on the windowsill, flowers in the planter box, or corn in a parking strip. 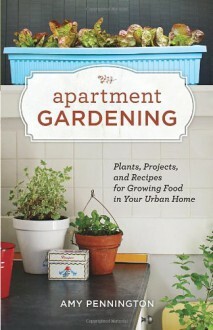 Apartment Gardening details how to start a garden in the heart of the city. From building a window box to planting seeds in jars on the counter, every space is plantable, and this book reveals that the DIY future is now by providing hands-on, accessible advice. Amy Pennington's friendly voice paired with Kate Bingham-Burt's crafty illustrations make greener living an accessible reality, even if readers have only a few hundred square feet and two windowsills. Save money by planting the same things available at the grocery store, and create an eccentric garden right in the heart of any living space. Quick, simple tips and tricks for the lazy, time'n'space-restricted, and frequently-housemoving gardener.